If you are looking for wholesale palms in St. Petersburg, Florida, A Quality Plant has what you need. We provide high-quality palms whether you are looking for container palms, field grown palms or specimen palms. A Quality Plant is a premiere wholesaler of Florida palms. We offer a wide variety of palms for you to choose from to create an interesting and beautiful landscape or to add a tropical touch to your home. The Areca Palm is a container palm that can grow up to 10 or 15 feet with dark green leaves that can be up to five feet in length. The pale yellow flowers add a bright touch to any décor. For a totally different look, the Bismarck Palm is sure to enhance your outdoor landscape. Because it has minimal requirements, this plant is ideal for the busy homeowner. It can grow up to 60 feet and features silver-blue leaves up to six feet in length with brown speckled flowers. We produce palm trees here locally and ship to customers all over the United States who want the unique beauty of these plants. For someone who is looking for a smaller palm tree in their yard, we might suggest the Chinese Palm, which grows up to 20 – 35 feet in height. The palmate leaves can grow up to five feet long and are a lovely pale green color. Once this plant is established, it is tolerant to dry conditions. It bears magnificent pale yellow flowers, which are as long as three feet in diameter. Another small option we offer is the Christmas Palm, which grows up to 25 feet with leaves that are up to seven feet long to create a spectacular first impression. This plant originated in the Philippines, but it is now found here in Florida. We not only provide high-quality plants for our customers, but they often come to us for advice on which wholesale palms will work best in their environment. When choosing a palm, you must consider the shade requirements as well as how much water is required and the amount of space you have for the plant. Palms start out small, but they can grow to be massive over time. 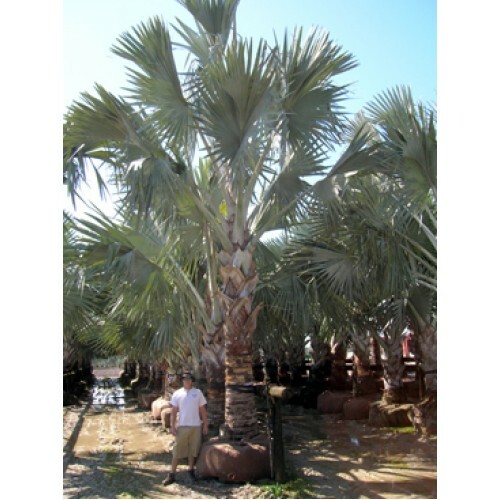 A Quality Plant provides palm trees for residential and commercial customers throughout the United States. We work hard to maintain a top-notch reputation for the quality of our plants and the knowledge of our staff. Call us today to find out what palms we have available for your area. We have a sales representative available to answer your questions. Contact us at 866-998-9393.